HOWYWOOD KINDERGARTEN! : Hip, Hip Hooray for the 100th Day! Hip, Hip Hooray for the 100th Day! 3. Create a shirt or hat with 100 items on it and wear it to school! Craft stores have cheap blank shirts and hats (as well as lots of things you could use to decorate with!) or kids can even use a shirt or hat they already have at home! 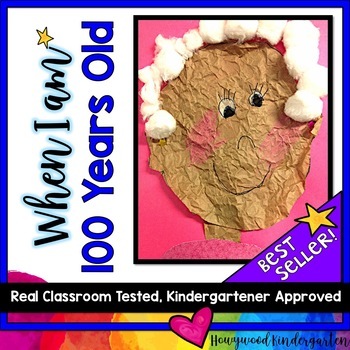 One of my favorites is a shirt covered with 100 band-aids (which is cute as it is, but it gets better...) and then write on it: "I survived 100 days of Kindergarten!" I wish I had great pictures for you, but if you Google the shirt idea, there are a TON of great pics and ideas on "the net!" 2. Just dress up! My daughter's class is doing this. Kids are allowed to just wear a costume from home. Almost like Halloween (nothing scary is allowed) in the middle of Winter. She's SO excited! 1. The classic and awesome: dress up like you're 100 years old! You can wear your pajamas and robe to school! Or find a fun flowery dress and some pearls... oh my... so great! Do you have access to a walker or white hair paint? I've done this one before too and the BEST was when I had a little guy who ACTUALLY shaved the top of his head and left hair all around the sides. Oh, man... wish I had a picture of that for you!! Counting to 100 (and beyond) is an important skill we want our kiddos to learn. Movement and music can help get this to "click!" So here are a few of my FAVORITE tried and true videos for practicing counting to 100. I'm doing it with my class today and will post some pics once they're done. I hope you have a very HAPPY 100th Day of School! It's definitely an accomplishment worth celebrating! Weaving MATH into your day!